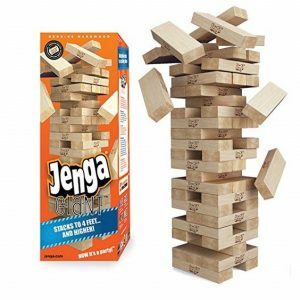 Taking the third place after Scrabble and Monopoly, Jenga remains the absolute blockbuster in the world of board gaming titles. Probably the secret of this timeless classic game is in its simplicity. Players have 54 bricks of the same size, which they use for building a tall wooden tower. Then every gamer must take out one piece out of this construction and put it on the top. The loser is that player who won’t manage to pull and place the brick without breaking the whole tower. Since the 1980s, the classic title survived through a few important transformations. There are Jenga versions where people have to write something down on the bricks and pull out the pieces only with certain words during the sessions. There are variations when gamers have to play the game of “truth or dare”. There are also gigantic towers of blocks up to 5 feet, for playing outdoors. The key is to make sure the opponents will make the construction unstable before or after you. It’s significant that many therapists adapt the game and use it as an effective tool for building language, speech, and social communication skills. That’s why Jenga is a common guest at playrooms, schools and caregiving centers. At many points, this simple but always exciting block-building game has no rivals. No wonder there are so many varieties. Many contemporary manufacturers add twists to the classic Jenga rules. 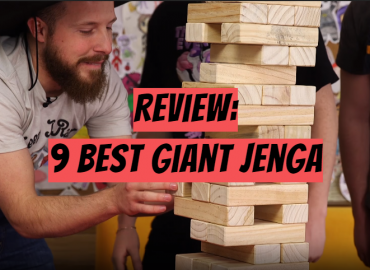 The following review covers 30 most popular and interesting versions of Jenga, including the all-time classics and bizarre adaptations. 30. 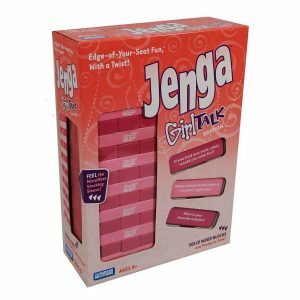 Jenga Pink Girl Talk Edition — the best Jenga game for teenage girls! This is a pink “girlish” version of the classic title. Every rectangular block contains interesting questions for young teenage girls. The task is to pull out particular bricks and to build a completely logical story by answering the questions. The loser is not that one who destructs the stacking construction but who fails to continue the story. Another challenge is to finish the 3-brick story before starting the new one. Players must use only one hand for pulling out the pieces. The questions are very simple: What is your favorite food, song, describe hidden talents, etc. Over 30 questions are offered. The outstanding title for young girls from 8 to 13 years old. The awesome addition to any teenage girl party or women empowerment group. 29. USAopoly Bob’s Burgers Edition — the greatest gift for the cartoon fans! Games like Monopoly or Jenga are good for product placement and advertising popular franchises. The cartoon Bob’s Burgers became insanely famous in the United States. That’s why USAopoly released the adapted version of a classic block-building activity, with favorite animated characters. Every player chooses 1 of 6 characters. The mission is to score as many points for each hero as possible. Custom bricks look like traditional burger components — a patty, bread, cheese, cucumber, greens, onion, etc. In the custom edition of the popular title, players control an 8-bit Burger Boss to destroy all burger ingredients and beat the score of Jimmy Pesto. 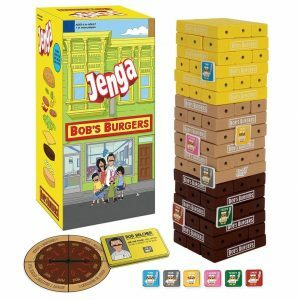 Made after Bob’s Burgers TV series, this product offers more than classic Jenga. Cheer up your favorite characters. A perfect gift for the show fans. 28. 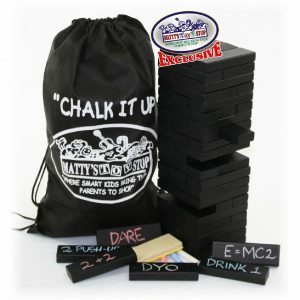 Matty’s Toy Stop Chalk It Up — the premium title for creating personal rules! Costing less than $20, Matty’s Toy Stop Chalk It Up is awesome for those gamers who got used to making their own rules. All bricks can be covered with chalked writings. This item is aimed at mental and physical skills. Players may create the whole stories and design their own wordplays for adult and family parties. The plain wooden tower will become a stylish black construction with very authentic chalked notes. The Matty’s Toy Stop Chalk It Up product is very affordable and stylish. It delivers endless options for making the individual rules for each gaming sessions! 27. 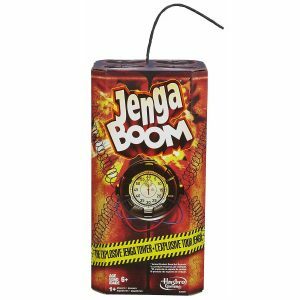 Jenga Boom — the most explosive edition with tough timing! The Boom version delivers real fun for gamers who love to tickle their nerves. Before the gaming setup, players must turn on a detonator and pull out the blocks over the course of time. The item offers 36 hardwood blocks, a toy detonator, detailed instructions and stacking sleeve. 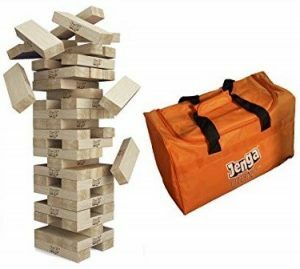 Very explosive fun is offered to the fans of Jenga title — experience how it feels like to build a wooden tower with a ticking detonator. The creative spin-off of a popular title with the gameplay and ticking timer. 26. 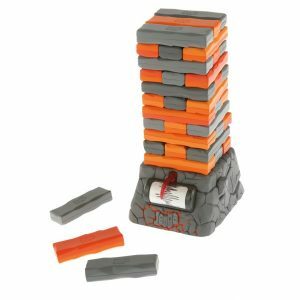 Hasbro Jenga Quake — the classic title with a spontaneously vibrating tower! Another version with the twist of the popular item that costs less than $18. What can gamers do with a spontaneously shaking construction of wooden blocks? First of all, the tower looks even more unstable than a usual one. Secondly, the product looks in a very interesting way. Very bright bricks make the whole process even more entertaining. The rules stay the same but everyone should think faster because the tower shakes frequently when the session is close to the end. The amazing addition of the modern Jenga family with shaking experience. 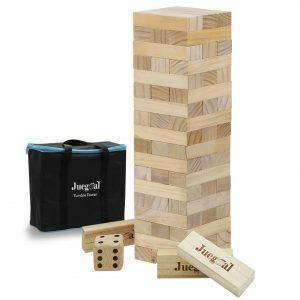 Jenga Quake offers a new experience with the shaking tower and increased fun. 25. 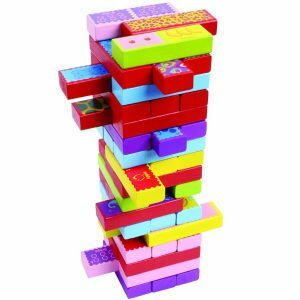 TOP BRIGHT Colored Wooden Blocks — the best Jenga for little kids! This particular game was created with one simple mission — to drive innovative thinking in kids aged 4-8 years. The gameplay focuses on using special cards with images that stimulate the creative way of thinking. All pieces are also covered in colorful paints that do not contain any harmful chemicals. The components are ASTM approved. The best pick for parents who want their kids to learn Jenga and animals in a funny manner. Let the kids become creative and spark their imagination with this awesome edition of the all-known game. 24. 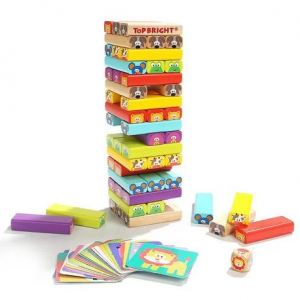 Oojami Wooden Toppling Tower — the painted wooden blocks for stacking under $12! 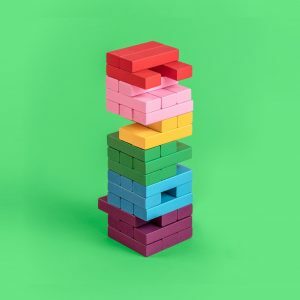 Oojami released their own version of the well-known block-stacking tower made of 60 painted pieces. The offered set includes 1 dice and a convenient storage bag. The dice decide what color of blocks must be pulled out of the tall construction. The task is to avoid the fall of all pieces. Suitable for matches of 2 players and more. This affordable bundle can be recommended for family gaming nights! 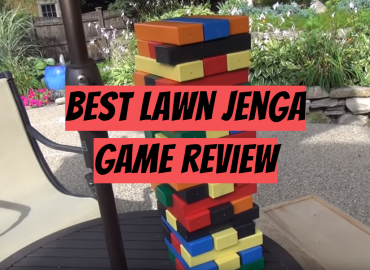 The great tumbling gameplay and colorful bricks make this version really exciting to play with family and friends. 23. Lewo Wooden Stacking Board — the 48-piece tumbling masterpiece! The brick-building gameplay never gets old! Players have 48 colorful pieces to construct a tower and then make sure it falls down as late as possible. Costing less than $12, the game is thoroughly packaged. The Lewo item is suitable for 2 or more contestants. The product is of great size for little children’s hands. The package includes the rolling dice and detailed guidelines. The Lewo Wooden Stacking Board is good for color recognition and playing with little kids. The cheap 48-block tumbling set for having fun in the family circle! 22. JengaGIANT Premium Hardwood Game — for building up a 3-feet wooden skyscraper! Players who are older than 10 years are allowed to be contestants with this particular edition. Being a bit pricey (over $120), the bundles distinguishes with 54 hardwood polished blocks and a sturdy box for more convenient storage. This is a really premium gigantic edition of the classic tumbling title. The gameplay of JengaGIANT is very funny and allows creating the massive wooden construction that falls down epically! Playing an XXL version of the original board title is pure fun for outdoor activities! 21. JengaGIANT Genuine Hardwood — the greatest choice for building a 4-feet construction! This premium edition offers bigger stakes for those gamers who seek for the most gigantic tower-building titles. One of the best amenities is an enormous storage bag for quick transportation of all hardwood blocks from one place to another. 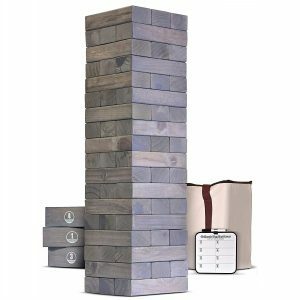 This is an ultimate gaming activity for outdoor parties — create a 4-feet tower of enormous bricks made of natural wood! The oversized 54-brick version of the popular gaming product. Good for outdoor playing! 20. 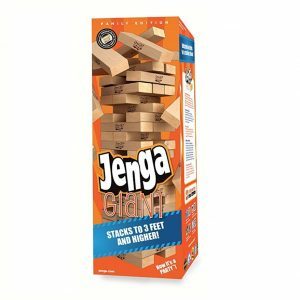 JengaGiant Family Hardwood Stacking — the gigantic block-stacking title under $100! With the price tag less $100, this is the smallest edition in the family of JengaGIANT hardwood board titles. Due to the decreased size, this particular product is awesome for younger kids (from 8 years old). Designed for family parties, the bundle offers authentic but oversized bricks resembling classic blocks. The most budget-friendly version of a premium JengaGIANT hardwood title! This is the best option for the fans of massive block-stacking games! 19. JengaGIANT Genuine — just like a classic game but much bigger! Previously in this review, the similar product from the same lineup had been covered. This item has a few slight differences. First of all, it doesn’t come with a handy storage bag, only a sturdy cardboard box. Players start with setting up a 22-inch high tower made of genuine hardwood bricks. To boost this construction, the manufacturer advises purchasing the special booster pack with additional authentic blocks. 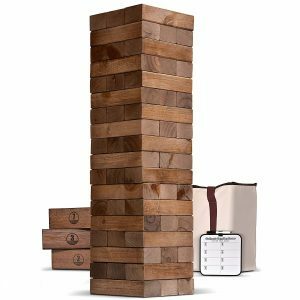 It’s a top-notch bundle for its price, with classic Jenga vibes. 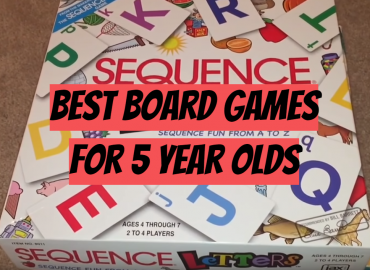 This JengaGIANT title will satisfy everyone who likes outdoor board activities for simple and classic fun. 18. 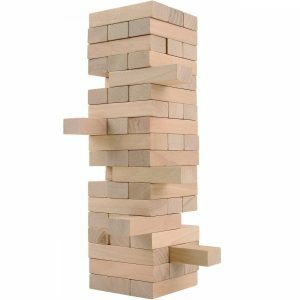 JengaGiant JS7 Hardwood — the biggest 5-feet brick-stacking product for outdoor fun! 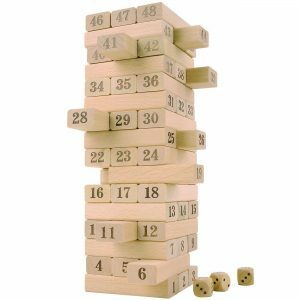 Suitable for players who are older than 12 years, this bundle offers 54 hardwood bricks for building a 5-feet tower outside. This gaming setup may be adapted for adult drinking or family nights. JS7 is good for playing alone or with buddies. It’s possible to write on bricks and make the classic gaming process even funnier. JengaGIANT JS7 offers multiple options for the fans of massive block-stacking towers! The giant JS7 is one of the greatest titles for the fans of outdoor parties! 17. JengaPremium Hardwood — the authentic top-notch title with 54 hardwood blocks! Fans of classic board games are looking for genuine titles with high-end blocks made of real wooden pieces. This particular premium product offers 54 precision cut and polished hardwood pieces stamped with copper foil. This bundle will last for many years, so buying it will be a smart investment. This hardwood edition has an engraved famous logo on each brick and a transparent base for amazing gameplay with friends! The JengaPremium is an exquisite title with premium hardwood bricks! 16. Sports Festival Giant Wooden Tower — the most massive gaming set made of raw wood! Looking for a funny tumbling game? This Sports Festival bundle is awesome for the lawn gameplay. An easy-to-carry bag makes this set portable. Enjoy playing with buddies this jumbo title. One of the greatest products in the famous lineup is offered under $100. Unlike authentic products, this is the most affordable item with a classic block-stacking tower. Also, this is a giant 60-brick raw wood edition that allows building a massive 2-feet skyscraper with 20 rows. One of the most budget-friendly Jengas for group events, parties, camping, and other outdoor activities. 15. Splinter Woodworking Co — the 60-block tower with outstanding classic gameplay! Another oversized outdoor Jenga with big bricks. The main difference is the ability to construct a 5-feet line of 60 huge bricks. Compared to the classic title, this one can offer 60 massive bricks, instead of 54. Despite the size, bricks are lightweight and won’t hurt the players when falling. Also, unlike most giant boards this product is good for playing indoors and outside. Made in the USA this Splinter Woodworking product is a great alternative to old-fashioned items. 14. Tailgating Pros Giant — the best 60-brick title under $70! Players make a 60-block tower with 20 rows, over 5 feet. Made of pine timber this stacking title offers the bricks with smooth edges for a safer and easier grip. This jumbo-sized product may be worth the buyer’s attention due to a high-density carrying case. It’s suitable for the players aged over 8 years and can become a great addition to any outdoor party. Tailgating Pros Giant comes with a lifetime warranty. 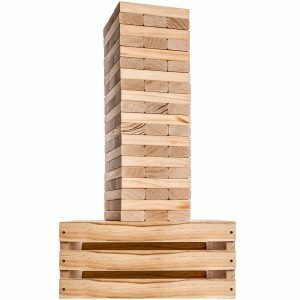 The perfect 60-block stacking tower with the price tag less than $70. 13. Yard Games Giant — the best jumbo-sized game with a nylon carrying case! The whole family can enjoy playing the Yard Games Giant. It comes with 56 original bricks (2 spare pieces) for delivering the classic tower building of 2.5-feet tall. This unit was specifically designed for indoor/outdoor activities like BBQs, group parties, camping, etc. The peculiar feature of Yard Games Giant — a high-quality durable nylon case for keeping all 56 pieces in one place! The good choice for active use with kids and pals. The Yard Games Giant is awesome when it comes to packaging and the optimal size for indoor/outdoor activities! 12. Seville Classics Premium — the 4-feet block stacking title under $65! The great set for the ultimate summer plays outdoors. Imagine what a family picnic will be like with this oversized edition of the all-favorite title. When assembled the wooden skyscraper stands at least 1.5 feet tall. When stacking up during playing up to 4 feet. The item is cool for 18 rows of block stacking. The main distinctive feature of this version is the budget-friendly price tag — under $65! 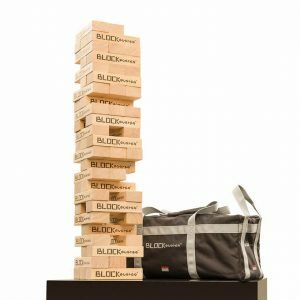 Specifically designed for competitive gaming activity this title delivers the ultimate Jenga experience with an oversized twist! 11. 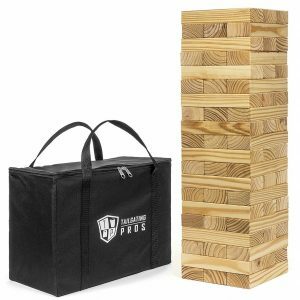 GoSports Gray Giant Wooden Toppling Tower — the premium pine edition under $90! 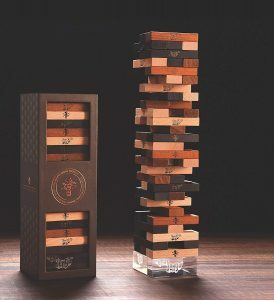 Varied by the type of wood used for the bricks, every GoSports Jenga-like game is good in its own way. This particular GoSports product is a premium version where every piece is made of natural pine. 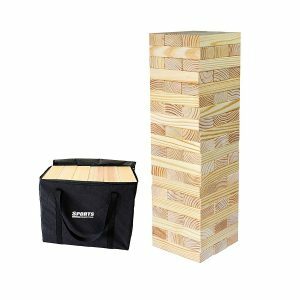 Players will enjoy the smell and look of wooden blocks that are heavy and durable, with almost a lifetime warranty. The peculiarity — stained solid pinewood bricks giving the set a real one-of-a-kind experience. Enjoy playing the premium 5-feet grand pine edition by GoSports at home parties. 10. GoSports Brown Wooden Toppling — the only edition with hand-selected pinewood bricks! The all-American favorite board activity resurrects as a giant premium pinewood edition by GoSports. This particular item offers classic gameplay with 54 hand-picked pinewood pieces. Gamers build a 2.5-feet tower that may grow up to 5 feet in the process. Thanks to the premium quality, users may expect the bundle lasts for a lifetime. GoSports supports all its products in the United States with a lifetime warranty, including these sets. GoSports Wooden Toppling is the perfect party-ready gaming activity with premium pieces! Pick the gigantic 18-row game for backyard playing — GoSports offers a lifetime warranty for this premium pinewood title! 9. 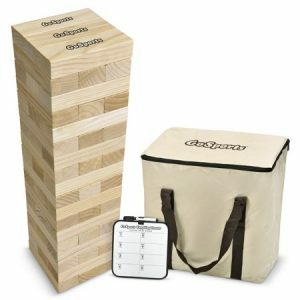 GoSports Toppling Tower — the block-stacking game with premium pine blocks under $80! GoSports board gaming titles are famous for their premium quality. Stacking up to 5 feet, this wooden skyscraper will epically fall. Styled with raw pinewood design every brick looks just awesome. This bundle is big but not gigantic — ideal for outdoor and indoor play! The best advantage for customers is the GoSports Toppling Tower bundle’s price — less than $80. The most popular GoSports stacking tower is back and it’s affordable enough to buy as additional gameplay! 8. Rally & Roar Toppling Tower — the premium colored set under $65! 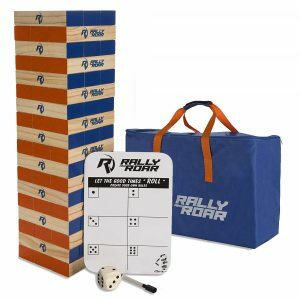 This Rally & Roar premium color edition includes a bonus wooden dice along with a dry erase board. Costing about $65, this set is one of the pro board titles in the category of giant tower-stacking bundles. The Rally & Roar toy is good for adult drinking parties and family nights but the players must be at least 8 years old. Prepare for the endless hours with a twisting and interesting gameplay! The multi-colored bundle with stylish bricks under $65 by Rally & Roar is a great gift option for all fans of board gaming activities! 7. 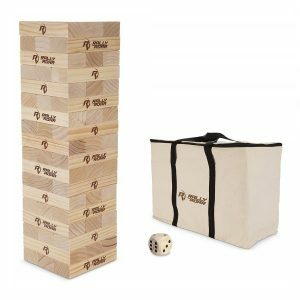 Rally & Roar Classic Toppling Tower — the great massive wooden set with a dice! Great for building a 2.5-feet tall construction with premium colored bricks. The Rally & Roar bundle is budget-friendly and includes jumbo-sized pieces. This title is good for transportation because of a heavy durable carrying bag with a wooden dice. The Rally & Roar products are famous thanks to durability and many additional features. A solid choice that will last for many years. Designed in the United States this pinewood bundle offers stylish orange and blue panels with a solid dice! 6. 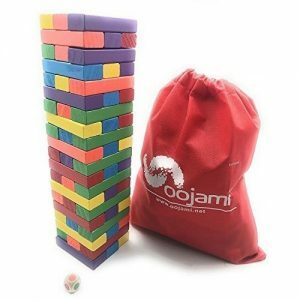 Juegoal Giant Tumble Blocks Game — a good gift for board gameplay fans under $50! This eco-friendly bundle is made of premium natural wood. The original bundle by Juegoal includes 1 dice with a durable canvas bag. Thanks to the average size compared to other giant editions, the set is great for adult and kid parties. The classic gameplay and original wooden blocks make this set a smart gift for the fans! 5. CoolToys Block Stacking — the smoothest 48-piece set with numbered blocks! 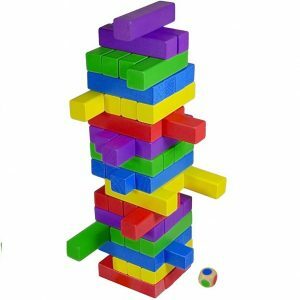 Check the price tag for this block-stacking toy — only $13! Kids aged over 3 years may have fun along with adult players when it comes to this set. It’s great for boosting hand-eye coordination and logical thinking. Also, the toy always makes children and adults happy. This edition is worthy of any fan’s attention due to multiple options. The premium 48-brick edition is budget-friendly and suitable for the fans of original gameplay! Enjoy playing a stack-and-crash gaming experience! All 48 bricks of this CoolToys bundle are quality and of the original shape. The great price deal is another reason to pay attention to this set in a store. 4. CoolToys Stacking Game — a 60-piece colorful playset under $15! Another version of an all-favorite gaming title for players aged from 3 to 93 years. The ultimate CoolToys package has 60 multi-colored bricks with 15 layers. It’s suitable for solo and group gameplay. The key rule is to build a tower with one hand only. This classic CoolToys gaming bundle expands a session because it’s possible to construct a 20-layer tower. This is by far the cheapest Jenga for kids — the ultimate CoolToys edition that costs under $13! 3. Timber Tower Wood Block-Stacking Game by CoolToys — 3 titles in 1 set under $20! With the price tag less than $20, this toy offers authentic tower-stacking gameplay that is suitable for children over 3 years. The set has 52 bricks for building 13 layers. Such amount gives a chance to construct at least 3 different variations of a wooden skyscraper. Players take turns to pull out and construct the top layers until the whole construction falls down. The classic, budget-friendly, and family-favorite — Timber Tower Wood Game by CoolToys is a great choice! 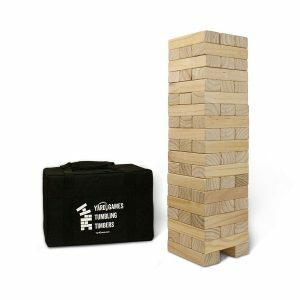 Timber Tower Wood Game by CoolToys stands for all classic gameplay elements that Jenga is famous for. 2. CoolToys Timber Tower — the original CoolToys 48-piece set for the fans of classics! Costing less than $12 this edition is the first one created by CoolToys. The manufacturer offers free 2-day shipping for all buyers. It’s suitable for the kids aged over 3 years because the version is completely safe and lightweight. Unlike the original bundle, this toy has 48 bricks for 16 rows. Logic and communication are significantly promoted when played regularly. CoolToys Timber Tower is a great and safe title that everyone will love! The original CoolToys bundle is cheap, durable and fun to play at any party! 1. 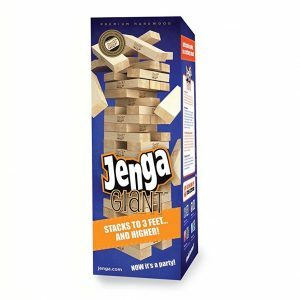 Jenga Classic Game by Hasbro — the cheapest classic Jenga that brings back the 1980s! Enjoy playing one of the best board games for families ever created with this classic Hasbro edition that is 100% legit. The title fully tests a player’s ability to think, plan and react to the slightest changes of the wooden construction. Despite all titles in this review, the original Hasbro product remains the same through ages. With the price tag around $12, this bundle is unbeatable. The rules of this board game are quite simple: just take out the bricks from the lower levels and put them the top level. While the previous level is not fully built, the next one does not start. The blocks can be knocked, pulled or pushed, but players can’t use both hands at the same time. Jenga, also known as Janga, Tower, Pile, etc. Listing all names for the Jenga’s clones is pointless. Because their amount is infinite. Regardless of the title on a box, all these games are united by one idea and incredible popularity. 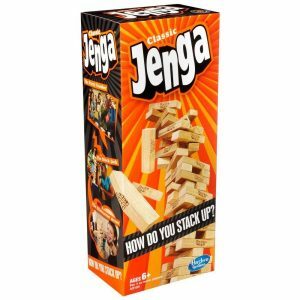 Jenga remains the most popular New Year gift when it comes to board games. Probably, due to very simple rules, thrilling gameplay, as well as a wide price range. The price tag for a title may vary from $10 to $150. This review covers all available options that are worth their cost. How to distinguish an original title from counterfeits? The original product consists of 54 rectangular wooden blocks. The surface of each block is carefully polished, but not coated with varnish or paint. Such effect increases the friction between the elements of the structure and does not allow the tower to crumble. The block sizes of the classic version of the game are 1.5 x 2.5 x 7.5 cm. With the growing popularity of these bundles, many of its “remakes” appeared on the market, the dimensions of elements of which may differ from the original title, but the ratio of the sides of the blocks is mainly preserved. In most fake editions, there are 51 blocks of rectangular shape. As a result, the initial tower is obtained one floor lower than in the classic name, but the height of the structure is greater. The most important difference is how players place the bricks. In counterfeits, the blocks are installed on the short side of the section with significant gaps between the elements of one row. At the same time, the original blocks stand close to each other on the long side of the section. 1. How many pieces are in Jenga? The classic title includes 54 authentic wooden bricks, they have to be smooth enough but not very slippery. Such amount is easy to explain: the creator Scott liked the number 18 and 54 is a multiple of it. However, the first ever product with such name offered only 48 pieces. The fun fact is that the worldwide record for this highest tower was 40 complete rows, back in 1985. 2. What size are Jenga blocks? 0.59 in × 0.98 in × 2.95 in. Despite the common belief, blocks are not milled to make sure they are identical. Some pieces can be a bit shorter, the others — a tad thinner. 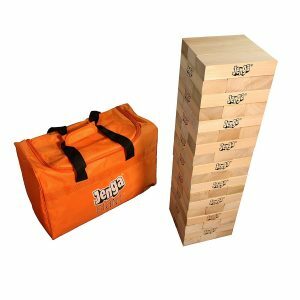 The board gaming designer Leslie Scott who founded Oxford Games Ltd. is a creator of the most classic edition of Jenga. The idea came up to her when she lived in Ghana, this title has African roots. 4. When Jenga was invented? The first board title with the classic rules was released in the 1970s. But the Hasbro product was introduced at the London Toy Fair in 1983. 5. What does Jenga mean? It’s derived from the Swahili word “kujenga”, which means “to build”. 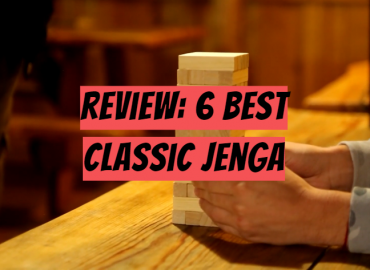 If to compare Jenga to other games, this classic board title has gone through some motions and changes. Every fan of family gaming nights and adult parties is now capable of finding the most fitting product according to his or her choice. Despite all twists and interesting solution, this all-favorite title still does the greatest trick — brings back the amazing childhood memories of pure joy and fun!